Here is a third picture, a photograph this time, taken about the same time as the previous two (Pictures 45 and 45.3), 1883 to 1887. It was published in 1900 in a popular magazine circulating primarily in New England, to illustrate an article about New Orleans. The editor probably did not realize, or did not care, that by 1900, this picture was quite out of date. 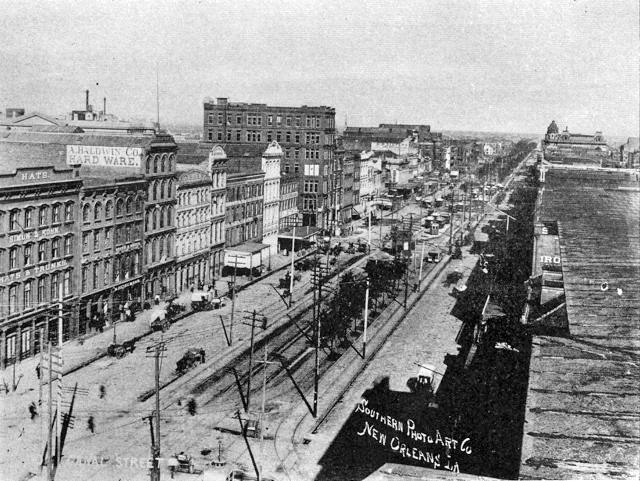 The cross street in the foreground is Magazine/Decatur, so the photo was probably taken from a window or the roof of the Custom House. We see the S curve that carried outbound Canal & Claiborne cars from a mid-street track alignment to the outer edge of the neutral ground. The next track comes in to Canal Street at an angle from Magazine Street at the left, making a broad curve to become the inner lakebound track. In the nearest block, there is a line of trees between these two tracks. The next two tracks (looking right to left) are those of the Crescent City RR, leading to its turntable in front of the fountain which we can see at Camp/Chartres Streets. Finally, the leftmost track is the inbound Canal & Claiborne track, which leaves the neutral ground for a mid-street alignment. The next two blocks out are completely filled with horsecars and small street railway buildings, and devoid of greenery. Beyond that, there is a double line of trees as far out as can be seen. There are plenty of poles throughout the picture, probably carrying telephone and power lines, but none for electric streetcar purposes — not yet. — Northern Photo Art Co., published in The Granite Monthly, Vol. XXVIII, No. 3, March 1900, p. 128.